You may have seen some big dogs before, but chances are you've never seen any the size of a Mastiff named Zorba. Learn about this legendary giant's weight, height and length, and see how he stacks up against other large breeds. When it comes to a combination of weight and height, the Mastiff is difficult to beat in terms of sheer mass. Saint Bernards may be capable of reaching greater size, but many don't reach the top of their impressive scale. The American Kennel Club standard states the male Mastiff should be a minimum of 30 inches tall at the shoulder, and have a muscular, heavy-boned body that is in proportion with its height. Many Mastiffs average up to 190 pounds, but it's not unusual for these giants to weigh around 225 pounds at full maturity. However, a dog comes along once in a while that amazes even the most seasoned big dog enthusiasts. On that note, it's time to meet Zorba. According to Mind Blowing Facts, Zorba is a legend among giants. 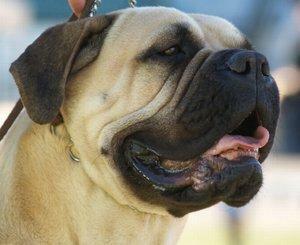 He was an English Mastiff that was so massive he earned a place in the Guinness Book of World Records. His stats are almost unbelievable. Standing on his hind legs, Zorba would have dwarfed the tallest basketball player the NBA ever produced! Zorba the Mastiff is incredibly impressive, but he's not the only giant dog to make the record books. Check out a few more record holders. Another Guinness record holder, Cloe was a massive Mastiff from Tibet that was one of the heaviest ever recorded. Weighing in at a whopping 365 pounds, Cloe stood 38 inches tall at the shoulder and measured 8 feet, 5 inches from nose to tip of tail. By the age of eight years old in 1989, he was said to have been the size of a large donkey. Mass is one thing, height is another. Until 2009, Guinness' record holder for height was Gibson, a Harlequin Great Dane that stood an unbelievable 42.2 inches tall at the shoulder. This amazing beast was about 7 feet tall when he stood on his hind legs! As of 2011, a blue Great Dane named Giant George was the Guinness record holder for the tallest dog. According to GiantGeorge.com, George's height was measured at 43 inches. He also weighed in at a whopping 245 pounds. Just for fun, compare Zorba and these other big dogs to one of Guinness' smallest living dogs of record. Heaven Sent Brandy was a Chihuahua that measured just 6 inches in length from the tip of her nose to the tip of her tail. Now for the smallest dog ever recorded. Sylvia the Yorkshire Terrier was a mere 2.5 inches tall, 3.5 inches long and weighed just 4 ounces. This would make her roughly the size of the Zorba's nose! Her life span was short; she was only two years old at the time of her death in 1945. Big dogs come in all proportions; some are taller, some are heavier and some are a massive combination of the two. To big dog lovers, bigger is usually better. Compare the average sizes of some of the largest dog breeds of all to Zorba's size, and you'll see why this dog was so exceptional. Great Dane 30-32" 105-120 lbs. Irish Wolfhound 30-32" 105-120 lbs. Neapolitan Mastiff 24-31" 110-150 lbs. Saint Bernard 28-30" 150-200 lbs. These breeds represent quite a lot of dog by anyone's standards, but remember these are only average size ranges. Some individual dogs may be slightly smaller than their ideal breed standard while others reach well beyond breed expectations. It's these giants that often find their way into the public limelight. Zorba was certainly an impressive canine, and he's sure to go down in history as one of the largest dogs ever. However, you have to wonder what the future holds. Which breed will produce the next giant to amaze everyone? Dog lovers will just have to wait and see.